The Emperor is a father figure. A stern disciplinarian. One who shows and gives us direction. He is loving but firm. The Emperor is not to be messed with or disrespected. Mars and Pluto are his ruling planets. And as we all know, Mars is a symbol of war, it is anything but passive. The Emperor – in the Zodiac – is Aries, the Ram. In the illustration of this tarot card we see the Ram repeatedly carved in on the throne of the Emperor. The Ram butts his way in, he does not require permission to lead the way, and is one amongst only a few animals who is not daunted by the sheer intimidation of mountains on his path. The ram light-footedly leads the way up the very same mountains that many others would avoid altogether. With Aries being the first on the Zodiacal procession, so too is the Emperor who looks to his right (namely the future) and leads the way. As any good father he provides guidance and direction. Teaching us that order and discipline have a valid place in our world. 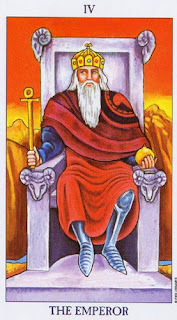 The Emperor is the 4th card of the major arcane in the tarot deck. In numerology the number four is a fixed number, solid, inflexible, and square. It is associated with the element Earth. Thus, the Emperor is grounded, practical and pragmatic. When this card appears for us, there is nothing airy-fairy about the energy emitted from it. The Emperor demands in a no-nonsense way that we demonstrate order and structure, and that we remain grounded in our efforts to reach new heights in discipline. There is much we can benefit from a structured and orderly discipline, especially as Pagans who often reject authority. However, in this context the authority that the Emperor is demanding we adhere to is the authority that we have over ourselves. The authority to push ourselves harder in pursuit of higher levels of attainment in our meditative and magical practices. None of these miraculously appear without adhering to a strict discipline of practice and routine. The no-exception rule of a daily regime of yoga or meditation or some other discipline that will strengthen us and enable us to travel as confidently and light-footedly as Ram does across the rocky mountains to reach the summit of self awareness. Once we are trained and disciplined we become the Emperor who leads the way. The Emperor who displays discipline and structure, and who gives direction in an otherwise scattered world. Today we ask ourselves what areas of our lives we need to take control of and exert discipline over. What areas of our lives do we need to firmly lead out of chaos and into order? It may be something as simple as straightening out our living environment, creating order and structure in our living space so that the energies may again flow freely instead of stagnating and causing blockages. Or we might be prompted to take a long hard and honest look at ourselves and come face-to-face with the reality of our ungroundedness. In doing so we may achieve heights that previously seemed unattainable to us. Perhaps we should consider the message that this card brings to us today as a sign that we can address those issues in our lives that we have been putting off for so long. Let us not become overwhelmed, instead we should try to focus on only one thing that can be improved in our lives today if we were to commit to a routine or discipline for a set period of time. Do we want to lose weight and get into shape perhaps? Now is the time to take the Emperor approach to that goal. Or, perhaps we want to gain control of our finances again, eliminate our debt and get into a position where we can begin to save money every month. Whatever areas we need to work on, I have no doubt that we will all benefit from the rewards that we will create for ourselves if we follow the advice of The Emperor, get off our proverbial butts, and take the required action to instil the necessary order, routine and discipline that is needed to achieve those goals.